'); } --> ANTIQUE RIVET JEANS NEW WITH TAG ANTIQUE RIVET JEANS ---Get the skinny on great style when you slip on the Antique Rivet™ Juniors Jeans. ---The Juniors jean slim fit with a medium rise and slim thighs that narrow into straight legs. ---Undergound wash is a dark indigo with light sanding and several top layer tears on stretch denim. ---Decorated back and coin pockets feature intricate stitching and button flaps. ---Contrast stitching throughout. ---Classic five-pocket construction. ---Skinny thighs with tapered cuffs. ---95% cotton, 5% spandex. ---Machine wash cold, tumble dry low. ---Imported. ---Measurements: ------ Inseam: 32 inches ------ Front Rise: 9 inches ------SIZE: 26 Check out my [other items] (http://search.ebay.com/_W0QQsassZmyboutique362QQhtZ-1) [favorites list] (http://my.ebay.com/ws/eBayISAPI. All photos are of the ACTUAL product that you will receive. LEG OPENING 8.5". FRONT RISE 6.75". 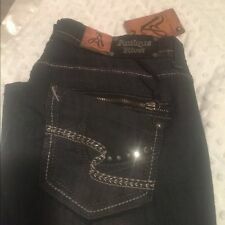 NWT black Antique Rivet Nala stonewashed Jeans with leather and zipper back, size 30, 73% cotton, 26% Polyester, 1% spandex, made in China. ANTIQUE RIVET. 98% Cotton ~ 2% Spandex. Zipper Fly w/ Button Closure. Inseam ~ 16". Total Length ~ 22 1/2". Women's Antique Rivet Size 5/27 - Black Denim Jeans Pants - 28" x 31.5"
98% Cotton & 2% Spandex. Style: Distressed Low Rise Bootcut Jeans. Designer: Antique Rivet. Material: Cotton Blend. Color: Dark Wash. Hem Width: 8.5. Women's Antique Rivet jeans 27 boot cut with white leather and rhinestone embellishment. New with tags. Overstock merchandise. In Graceland dark color wash. Machine wash cold and tumble dry on low. Belt loop waistband. Zip fly and button closure. Leg Opening: 17”. The material is 98% cotton and 2% spandex. The fabric is lightly distressed. These low rise jeans are in very good condition. I am not a tailor. I have noticed, however, that sizing of pants is not uniform. These jeans are in excellent condition. Unique Looking Jeans. Copper Hardware. Color: Blue Denim. Antique Rivet. Materials: 73% Cotton, 26% Polyester & 1% Spandex. With the jeans laid flat. Rise: 6.5". Color: Blue. 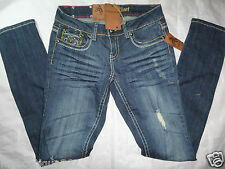 Womens Antique Rivet distressed bling bling blue denim jeans. They are a size 26x29 and are nice and clean. Check out the super sized photos. You know what they cost new! See specifications for measurements. Check out my other auctions for jeans. Check out the super sized photos. Waist laying flat= 14.5" In seam= 29" Total Length=36" cuffs bell - inches Payment can be made via Paypal Only. Shipping is $6.99 to the Lower 48 states only. Once the pants ship, I will provide you with a tracking number. Antique Rivet Jeans Size 9/29 yellow Distressed Embellished Pockets Straight Leg. Condition is Pre-owned. Shipped with USPS Priority Mail. Antique Rivet Size 3/26. Factory distress. '); } --> ANTIQUE RIVET JEANS NEW WITH TAG ANTIQUE RIVET JEANS ---Instantly modernize any of your favorite looks with these chic Juniors Straight Leg Jeans. ---The Juniors Straight Leg jean accentuates your waist with a medium rise and slightly slim thighs that narrow into straight legs. ---Jet Black is a deep black on stretch denim for a truly upscale look. ---Decorated back and coin pockets feature rustic metal studs. ---Contrast stitching throughout. ---Brand patch at back right waist. ---Classic five-pocket construction with button-flap rear pockets. ---98% cotton, 2% spandex. ---Machine wash cold, tumble dry low. ---Imported. ---Measurements: ------ Outseam: 39 in ------ Inseam: 32 in ------ Front Rise: 7 in ------ Back Rise: 11 in ------ Leg Opening: 13 in ---Product measurements were taken using size 26, inseam 32. Leg opening Laying Flat 8.5". Size 27 x 32.5 " Inseam. 73%Cotton 1% Spandex 26% Polyester. Light Fray Pocket, Worn Fray Hem. ANTIQUE RIVET. 73% Cotton ~ 26% Polyester ~ 1% Spandex. Bottom Leg Width ~ 7". Zipper Fly w/ Button Closure. Lower Rise Waist - 31". Total Length ~ 39 1/2". 5 Pocket Style. Inventory # A233. Color: Indigo Wash. This item is in excellent used condition. We are only human and can tend to make a mistake every so often. Waist: 32"
Rise: 7.5" Cuff Opening: 8.5". Cute black jeans from Antique Rivet with faux leather and rhinestone pockets. leg opening- 6". ANTIQUE RIVET Women straight leg jeans Size 26 Dark Wash Denim Embellished . Condition is Pre-owned. Shipped with USPS Priority Mail Flat Rate Envelope. Grey stitch work. Dark Wash. Whiskering detail. 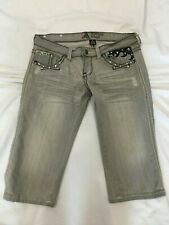 Womens Antique Rivet Jeans Size 9/29 EUC Embellished Pockets. Condition is Pre-owned. Shipped with USPS Priority Mail. Please look close to pictures. The back label is peeling off. All studs still there. Material Cotton,Polyester,Spandex. Type Jeans. Discover daily new arrivals in all seasons, sizes and styles that you can't find anywhere else. Color Black. All details of the product have been included. Very Gently Used Antique Rivet Jeans. 73% Cotton 26% Polyester 1% Spandex. 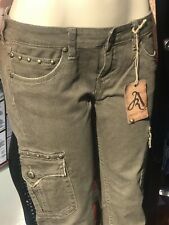 Antique Rivet Denise Jeans Size 27 Straight Leg AR5408 Originally $115. Shipped with USPS Priority Mail. 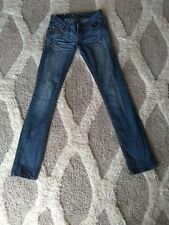 Antique Rivet New Blue Jeans Womens Size 24 Straight Leg Villanova Retail 79.00. I accept Pay Pal only! Thank you for looking! BOOT CUT 8.5 IN. RISE 8 IN. INSEAM 33 IN. Instantly modernize any of your favorite looks with these chic Scarlette Juniors Jeans. Frost wash is a clean white with tonal stitching throughout. Machine wash cold, tumble dry low. Leg Opening: 11 in. Antique Rivet Cotton Blend Acid or Stone Washed Distressed Skinny Ultra Low or Low Rise Jeans - Size - 27. This item is in Very Good Pre-Owned condition! 98% Cotton and 2% Spandex. They range as follows. Thigh (1in down from crotch) 8". Front Rise (Crotch to waist) 7”. Leg Opening (width of leg opening) 6”. Inseam (Cuff to crotch) 33”. Material Cotton,Polyester,Rayon,Spandex. Type Jeans. Discover daily new arrivals in all seasons, sizes and styles that you can't find anywhere else. Color Blue/Navy. Item Details. Leg Type: Skinny; opening 6" laid flat. Hardware/Closure: Zip-fly with rivet button. Embellished around front pockets. Care: Machine wash cold; tumble dry low. Front Rise:7 1/2 " (crotch to waist). Inseam: 31 1/2" (crotch to hem). M0481224 in.25 in.26 in.27 in.28 in.29 in.30 in.31 in.32 in. 31124 in.25 in.27 in.29 in.30 in.31 in.